Proton therapy is an advantageous choice for the irradiation of tumors in proximity of critical structures due to rapid dose fall off and high dose deposition at target compared to dose at the surface of the patient (ie, peak-to-entrance dose ratio (P/E)). However, with target fields below 1.0 cm, as often encountered in proton radiosurgery, multiple Coulomb scattering (MCS) broadens proton beams leading to diminished P/E advantages and reduced dose delivery efficiency (DDE). Magnetic focusing tends to counteract MCS and is a promising method to reduce these undesirable effects. The purpose of this research is to investigate the advantages of proton magnetic focusing with a triplet of quadrupole rare earth permanent magnets. 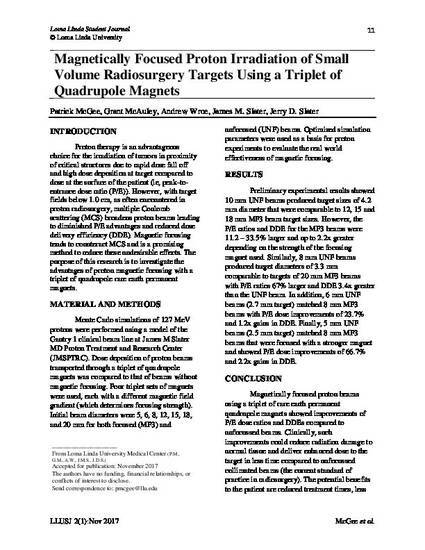 Patrick McGee, Grant McAuley, Andrew Wroe, James M. Slater, et al.. "Magnetically Focused Proton Irradiation of Small Volume Radiosurgery Targets Using a Triplet of Quadrupole Magnets"